Power Carver 400,000rpm’s Ultimate detailing tool 5 cutting burrs (3 carbide and 2 diamonds) very popular 5 feet clear tubing that connects to full regulation system On/off switch 1/4npt fitting to connect to regulator 1 blank stencil sheet 8 1/2” x 11” Training DVD Glass, Wood, Metal, Eggshell and more. Full catalog of burrs and supplies Full instructional guide Regulation System 5-micron filter Automatic Moisture release Stand for Regulation System Quick Disconnect. A 3/4hp with a 4-gallon tank Ultra Quiet air compressor. 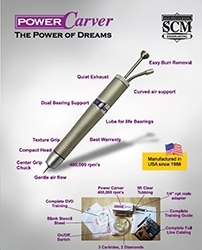 Power Carver System With full Regulation System 5-micron filter Automatic Moisture release Stand Extra Training DVD . Starter Bit set 25 of the most popular diamonds and carbides. 15 carbides and 10 diamonds.